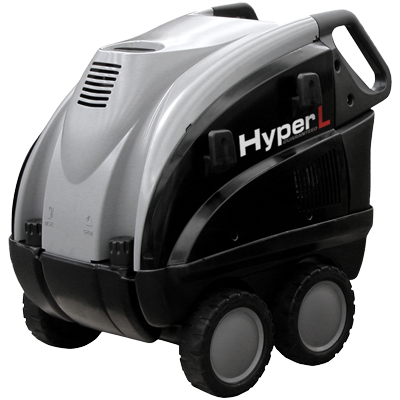 The HYPERL1211 hot water pressure washer is a heavy duty, top of the range professional quality unit. The machine comes with a large 3000W, four pole, 1450 RPM motor. 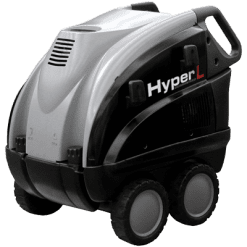 Also included is a low revving, 1450 RPM, heavy duty 3 piston plunger pump delivering 11.2 litres of water per minute at an operating pressure of 2000 PSI. The heating coil on this pressure washer comes with a class leading 5 year warranty. 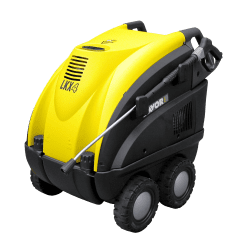 The pressure cleaner has an elastic joint coupling between the motor and the pump. This provides shock absorption on start up and stop for extra heavy duty use. 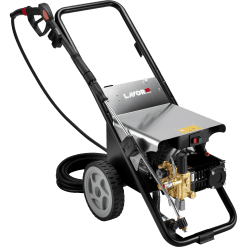 This pressure cleaner has a brass pump head with auto stop, ceramic piston plungers, an onboard detergent tank. Standard accessories include a heavy duty gun and lance, and a 10 metre steel braided HP hose. 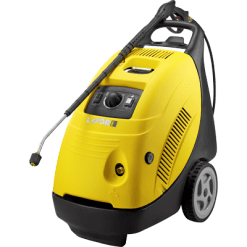 This unit is Lavor’s top of the range single phase hot water pressure cleaner which will stand up to very heavy continuous use. All of this while offering reliable performance which is suitable for any large project or cleaning job.